Every day is one day closer to the most wonderful time of the year. However, in this case, we are not referring to Christmas. Instead, were talking about a southern-style Halloween. Edisto Beach does Halloween right. From the Spanish moss the drapes the live oaks to the shadows upon the marsh, the setting is perfect for a semi-spooky atmosphere. 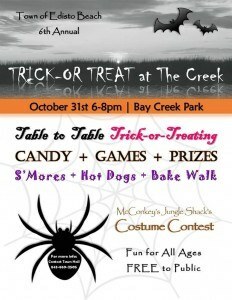 To add to this, once again the Town of Edisto Beach is offering Trick-or-Treat at the creek from 6-8 p.m. at Bay Creek Park. 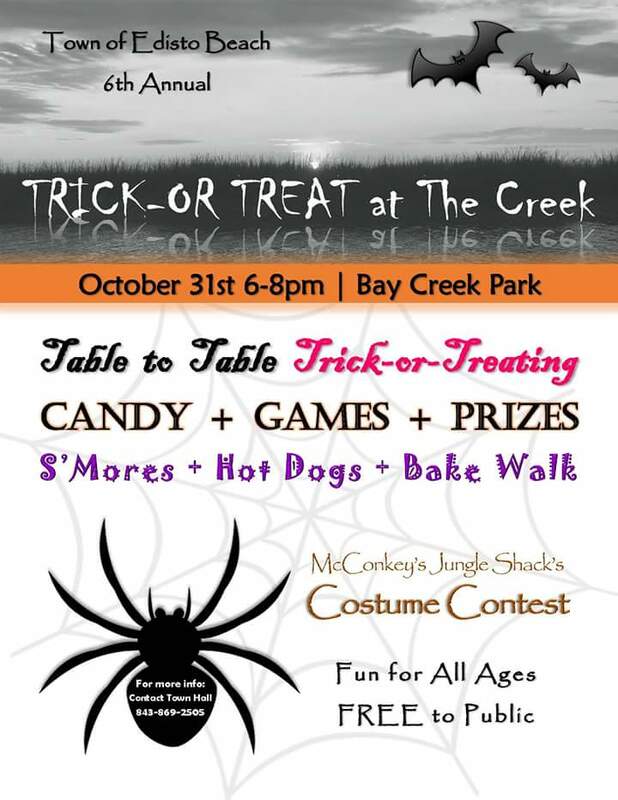 Each year, this event provides children and their families with a way to dress up and get together while enjoying a bonfire, games, arts and crafts, and, of course, trick or treating. So instead of canvassing the neighborhoods, children get the opportunity to come to a one-stop-shop and load up on candy to their hearts content. For those of you looking to have a little more adult fun, throw on a costume and hit up any of the bars and restaurants on the island. You might be the only one dressed up, but everyone appreciates a little bit of a festive vibe. Coming into town this weekend? Stop and get a pumpkin or get it on your way down. Remember though, the warm temperatures will turn those pumpkins into a pile of good within a week, so be prepared to say goodbye sooner rather than later. If youre not into Halloween, but enjoy the fall, take advantage of getting out and exploring Edisto. A great walk this time of year is at the Edisto Beach State Park. While that name would lead you to believe the entirety of the park is in the Town of Edisto Beach, the trails are located on the island (accessible right off of Highway 174). These trails will wind you through Edistos forests, past the creeks, and even to a historic oyster shell midden. This midden is thousands of years old and was created by Native Americans. The amount of shells is staggering and provides visitors with a view into the past. Plus, the walk out to the oyster mound is thoroughly enjoyable. If youre looking for more Halloween fun, head into Charleston. Stay tuned for another blog detailing some of the best events in the city.